When you get onto a good thing, you want others to take advantage of your new found knowledge, and experience the benefits of your newly discovered idea. Off you go to enthusiastically tell those in your family about organic virgin coconut oil, and sometimes your enthusiasm isn’t matched by those in your family. So what do you do? Select an option of one of our innovative coconut based foods for simpler healthy food preparation. Click on the product photos for more detailed information. Coconut Nectar Syrup is 100% sap from the coconut tree blossoms. It has a low GI (Glycemic Index) of 35 (honey GI = 50, white sugar GI = 65 ), so it’s great for diabetics (in moderation) and those concerned with weight loss. Rich in 16 key amino acids and high in glutamine. Buy two for a discount! Coconut syrup has a nutritional content far richer than other commercially available sweeteners. Certified organic. Not from concentrate. No additives or preservatives of any kind. Packed at the source in the Philippine tropics. This is not coconut milk, not coconut cream. It is whitish, cloudy coloured liquid that comes out of green coconuts if you drill a hole into them. There is nothing but certified organic coconut water in the packaging. And 100% pure coconut water doesn't taste remotely like coconut milk or coconut cream. It is a simple, refreshing, plain taste. This product is sent postage free. The price includes the postage. The taste is surprisingly refreshing, and it certainly makes you feel full of energy! Coconut Water contains natural chemicals that fight fatique, just like coconut oil. In fact, when a green coconut is left a little longer, it creates it's flesh, and makes coconut meat, from which coconut oil is taken. So many of the benefits of coconut oil can be found in coconut water. What benefits does Organic Coconut Water have? The price includes postage, as always. On special while stocks last. Best before date shown is August 2015. Not heated to more than 45°C during manufacture. Good sprinkled on food as is or for baking. Check out the quantity discount below for 2 or more bags. 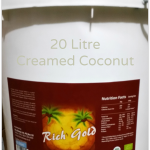 $11.94/kg for 5 kg of this premium quality coconut flour. Rich Gold Creamed Coconut (Coconut Butter) Creamed Coconut is also known as Coconut Butter. A great peanut butter alternative. You can add good salt or sugar to taste. Organic. No additives whatsoever. Creamed Coconut is 100% pure coconut meat made from unsweetened dehydrated meat of a freshly-harvested mature coconut ground to a semi-solid white creamy paste. As it’s in a concentrated form, you can make coconut cream or coconut milk by adding back hot water. As it has a hint of sweetness, it’s delicious eaten straight. What is texture and taste like? The texture is almost like chocolate without the obvious sweet taste. We love to scrape some with a fork and mix it in yoghurt. It’s a real treat and we almost fight over it. Also great in desserts, curry, soups and sauces. Beware! The Coconut Cream comes separated, as it separated as it should when it was bottled in the Philippines at temperatures above 24 degrees Celsius. The naturally occurring Virgin Coconut Oil portion is solid, and pure white when it is below 24 degrees Celsius. The liquid part is a creamy khaki colour. The smell is an authentic Coconut smell. Select from the Quantity Option below. Sorry sold out. More stock arriving in early August 2014. 5 kg Resealable stand-up pouch. Creamed Coconut is also known as Coconut Butter. A great peanut butter alternative. You can add good salt or sugar to taste. Organic. No additives whatsoever. Please note that creamed coconut currently comes in two layers of plastic bags inside the pail. This is to prevent spillage during transit (the outer bag is heat-sealed), as creamed coconut is liquid in Sri Lanka where the pails are filled, although it is almost always solid in the NZ climate. Creamed Coconut is 100% pure coconut meat made from unsweetened dehydrated meat of a freshly-harvested mature coconut ground to a semi-solid white creamy paste. As it’s in a concentrated form, you can make coconut cream or coconut milk by adding back hot water. As it has a hint of sweetness, it’s delicious eaten straight. What is texture and taste like? The texture is almost like chocolate without the obvious sweet taste. We love to scrape some with a fork and mix it in yoghurt. It’s a real treat and we almost fight over it. Also great in desserts, curry, soups and sauces. Beware! The Coconut Cream comes separated, as it separated as it should when it was bottled in the Philippines at temperatures above 24 degrees Celsius. The naturally occurring Virgin Coconut Oil portion is solid, and pure white when it is below 24 degrees Celsius. The liquid part is a creamy khaki colour. The smell is an authentic Coconut smell. If you live in an environment where it it is regularly below 24°C, when you buy this product in a 4L pail you have to decide how you will warm it to mix the ingredients - oil and fibrous meat portions. (We don’t recommend microwaving.) The 500ml jars are a handy size jar to dip in warm water to soften before use. Keeping it in a cupboard next to the hot water cylinder is one option. Putting in the sun for a while is another. Due to its weight, the delivery may take 2-3 extra days to arrive depending on your location. Gold Crunch is made from coconuts grown organically without the application of pesticides, herbicides or artificial fertilisers in Sri Lanka. Beware of coconut chips that are sweetened, without being labelled as sweetened. These chips are unique, they are the crispiest coconut chips we've ever tasted. Gold Crunch Raw Organic Coconut Chips are made from the low-heat-dried white flesh of organically grown coconuts - no other ingredients or preservatives. It can be used in baking, dessert recipes, added to muesli or sprinkled over rice or curry. Watch out, eating them straight out of the bag will grow on you! 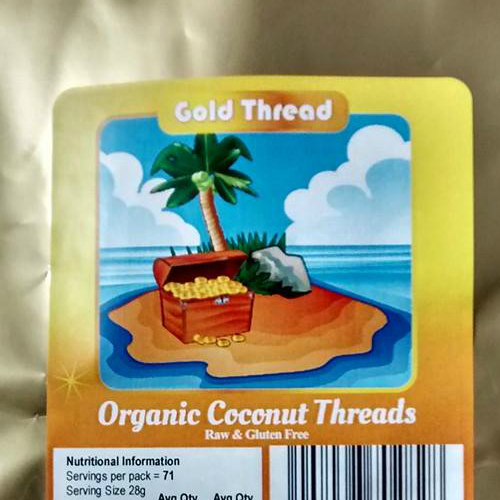 What makes Gold Crunch Coconut Chips different to Ceres and most other Coconut Chips? Undoubtedly the standout factor that makes Gold Crunch brand is the crispiness! They will make a resounding crunch sound in your mouth when you teeth first bite them. You'll notice the chips are extremely light, and perhaps if you are used to most other Coconut Chips brands you'll notice they are fresher tasting. The wonderful aroma of coconuts can be smelt and tasted while consuming these chips. They come from the same place as White Gold Raw Organic Virgin Coconut Oil. Allergen Information: This product IS packaged in Sri Lanka on a packing line separate from tree nuts, and gluten products. It is packed in a dedicated Coconut Mill. Then repacked in New Zealand in a dedicated Coconut area, free from other tree nuts, and gluten related products. There is no S02 in this product. It is pure coconut meat, chopped, and dried for you. So2 (Sodium Bisulphite) is added to some desiccated coconut, but not Gold Crunch certified organic coconut chips. Allergen statement: Processed and packed in the dedicated coconut-only lines and free from traces of other nuts, soy beans, dairy, wheat, fish or eggs. Unlike cheap desiccated coconut you can find everywhere, Gold Sprinkle Desiccated Coconut is completely free of preservatives (sulphates). Air-dried at under 48 degrees Celsius, it is fresh-tasting and always crisp. Compare the difference! Gold Dust Flour: not heated to more than 45°C during manufacture. Good sprinkled on food as is or for baking. Grain Free Chocolate Raspberry Muffin with Gold Dust Coconut Flour Check out the quantity discount below for 2 or more bags. $11.94/kg for 5 kg of this premium quality coconut flour. 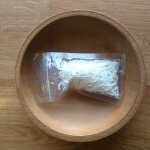 Sample (30g) Gold Thread RawDehydrated Coconut. Allergen Information: This product IS packaged in Sri Lanka on a packing line separate from tree nuts, and gluten products. It is packed in a dedicated Coconut Mill. Reconstituted Coconut Water, sweetened with coconut extract* for sensational taste 100% Organic Coconut Water from Young Green Coconuts, freeze dried in the Islands, and transported to the US for sterile packaging in recyclable, resealable, 1 litre TetraPak. (Recent price increase due to dramatic increase in the cost of product - due to exchange rates). The aim of this product is to produce a coconut water that tastes like you just cut open a young, green coconut. Each drop of Coconut Water delivers refreshing hydration. But more than just hydration, which anyone can obtain from any tap with ordinary water, Coconut Water has 5 electrolytes K, NA, Mg, CA and P. It is only 40 calories per 236 ml (8 fl oz.) serving and contains more potassium than a banana. Sometimes it is easier to slip the coconut oil down their throats while they don’t suspect it! There are various morally acceptable ways to do this, and there is also coconut flour and creamed coconut. Both of these products have virgin coconut oil retained in them. They are both made from the flesh of a coconut. Diet restrictions for a gluten intolerant diabetic would be very difficult to prepare food for. But coconut sugar is both gluten free and low GI. This is just one of the examples of how our range of other coconut oil products might help to add variety to a restricted diet. One of the big reasons why people consume virgin coconut oil is access the high levels of laurice acid. Dr Bruce Fife states that lauric acid is beneficial for our health, and is found in concentrated quantities through breast milk. Adults can’t access breast milk any more. So we turn to one of the only food sources with very high concentrations of that – coconuts. Coconut based products such as Coconut Nectar Syrup and Coconut Amino Sauce also provide your body with lauric acid. So if you can’t or don’t want to use golden syrup or soy sauce, but would like the taste of either of them, we may have some product you can enjoy. 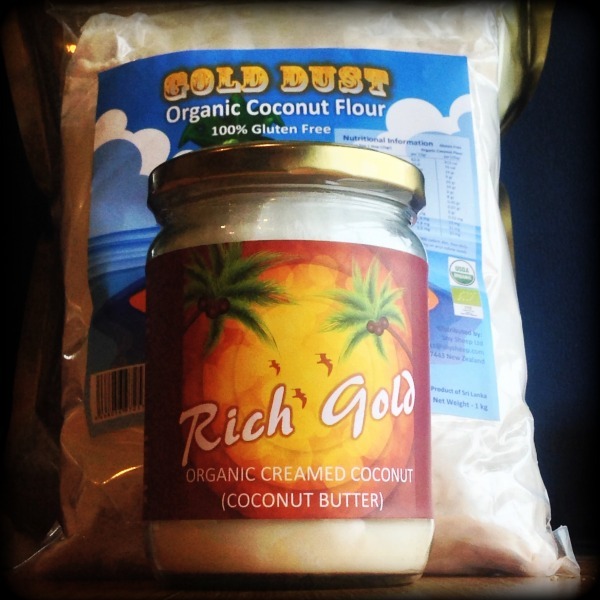 Our second biggest selling item other than coconut oil is coconut flour. We sprinkle coconut flour and flakes of creamed coconut on porridge, along with coconut sugar or coconut syrup. They add to the flavour! This is the aisle to explore when you are looking for innovative ways to slip coconut oil into your diet.